(TibetanReview.net, Mar11’16) – Chinese and Tibetan delegates who wore badges with photos of President Xi Jinping and past top Communist Chinese leaders during the country’s ongoing annual parliament session, which opened on Mar 5, have faced criticism from netizens for reviving the Mao-era practice of personality cult, reported the PTI Mar 9, citing China’s Caixin magazine. The report cited Caixin as saying internet users in China had reacted with unease, saying it appeared to be a return to the “cult of personality” crafted by Chairman Mao Zedong and employed during the violent Cultural Revolution (1966-76). 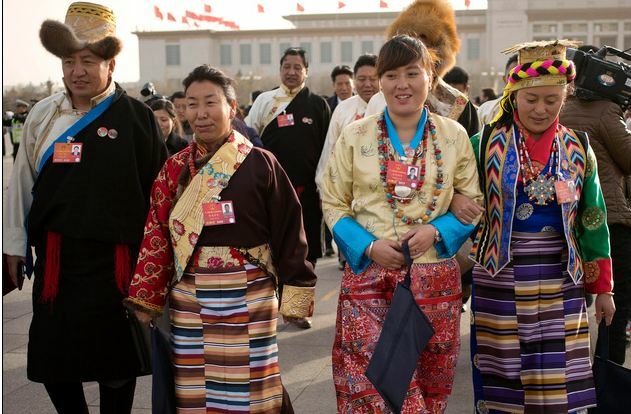 One of the two badges pinned on their lapels by the delegates representing Tibet showed a smiling President Xi, head of the ruling-Communist Party, talking to a Tibetan woman. The other showed the busts of Xi and his four predecessors as top leaders of the party and country, Mao; his successor Deng Xiaoping; and former Presidents Jiang Zemin and Hu Jintao. Many Internet users have been cited as saying the badges, which were similar to ones worn during the Cultural Revolution, were a reminder of a period which saw China being brought to the brink of collapse. “We should never allow the worship of an individual to become a fashion again,” one person was quoted as having written on Sina Weibo, China’s micro-blogging site akin to Twitter, saying the nation had moved past reminders of the cult of personality. Another blogger was reported to have written: “If they are not told to stop doing this, other delegates could follow suit next year”. Shugden followers’ anti-Dalai Lama protests a Chinese design?